I ordered the OCZ Platinum 4GB just in case - the last thing I want to deal with is memory that doesn't play nice with my heatsink when I'd rather just enjoy my new build. At the end of the day I'll pay $530 with shipping. I'll use my old case, graphics card, sound card, monitor, etc. Not bad for a top of the line AMD CPU, AM3 mobo with DDR3 memory. And since most of the time the computer is used for gaming, AMD Phenom is a no brainer for price/performance. Below is my current build so as you can see it has been a few years - looking forward to today's modern speed. Two of the top three articles are pumping the Phenom IIs as if anyone with a BRAIN would buy one. Seriously? You are recommending the Phenom IIs with "In WIN" Power supplies and Seagate hard drives? Why not rename Anandtech.com to PayAnandToAdvertiseJunkTech.com? The two articles also clearly said you should buy an Intel Core i7 if you have $290 or more to spend on a CPU. 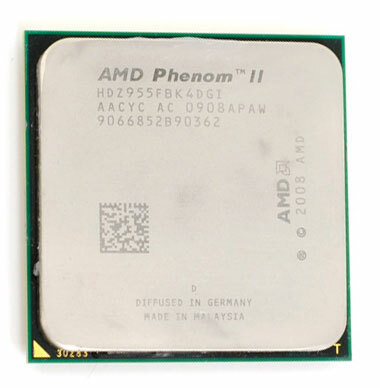 If you want to spend less on a rig then the articles recommend you buy a Phenom II. We also chose the WD 1TB for the Performance rig with a discussion of the issues with the early Seagate and the advice to choose the WD at $105 or the Seagate at $85. As for the nVidia 275 it is $30 more than the 4890. We also like to use AMD GPUs with AMD chipsets and processors if it makes sense - all else being equal. I guess since I am graced with having a MicroCenter close enough to make shopping there a viable option, I don't have to put up with the Newegg price gouge on Core i7 920 cpus and can buy them for $230, and even get the luxury of having a B&M store to do instant and easy returns for items, instead of the typical 2 week ship-return-reship boogie you have to play with Newegg. Hey, I can guarantee you that intel doesn't pay me to spread fud. Their CPUs deserve to be praised for technical leadership. I know my comments are usually negative, but ask yourself this question: did you guys deserve it? Anandtech isn't the same when anandtech got started , everyone knows it. Pumping inferior technology makes you look stupid that is all. Anyone recommending AMD platform right now over the nehalems has to really look deep into their heart and see if their intentions are honorable. Europeans are overly AMD biased because of Dresden fab. Right now AMD's business practice is dishonorable at best. Look at the way they flush their broken CPUs down consumers' throats. No, the phenom 2 955 is not that impressive: their uncore imc clockspeed is still castrated compared to their opteron line, and Istanbul will only exacerbate the problem. So, tell me why I would spend a few hundred dollars more to get 0.6FPS increase? Oh, I know why, its because you are paid by Intel to recommend them, to cause trouble. But one problem though - since you post in such an offensive and obviously trolling manner, your posts generally do the opposite of what you intend. People look at them and think, "Man whatever that guy is recommending, I'm having NONE of it, look how angry he is"
Besides, if Anandtech really were shills, who has more money - AMD or Intel? Who could afford to pay Anandtech to shill more? Yeah, if you gave me another $500 I'd consider a Core i7. Until you do that, I'll put my money where it makes sense - right now thats AMD, but if Intel drops prices on their C2Q's they would get my vote. I really dont care about brand names, I care about performance and price. That you get so offended at the idea of a Phenom 2 recommendation is laughable - Phenom 1 I agree was a piece of crap but Phenom 2 is leaps and bounds better. Quoting a GPU bound FPS benchmark to try to fudge CPU equivalence shows how stupid you really are. Of course the FPS would be close since you are using the same video card. This was my original complaint for the "phenom is a great gaming platform" bs. Please for your own benefit, stop calling me a troll, it makes you look stupid. But then again people already know that.